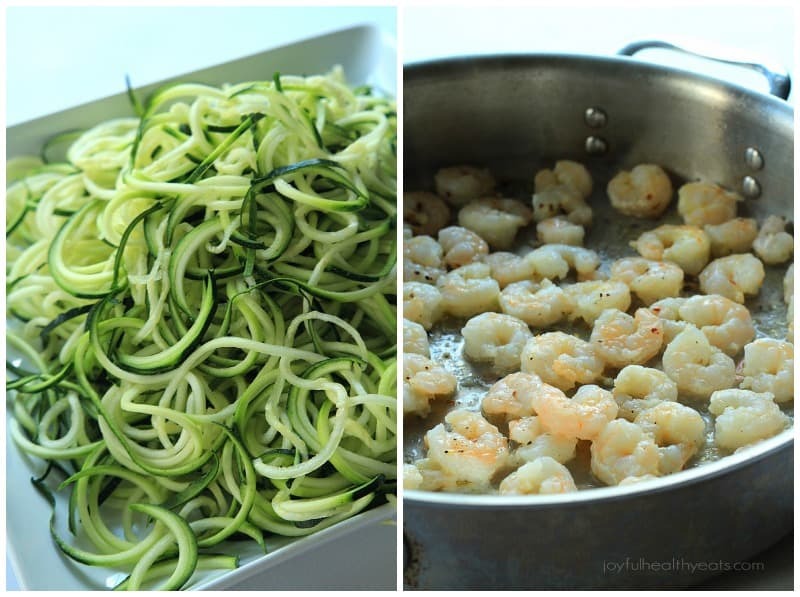 Healthy never tasted so irresistibly good with this easy Shrimp Scampi and Zucchini Noodles. So if you follow me on Instagram, which if you don’t, you should… because… well.. I’m cool.. DUH! But for real, if you follow me on Instagram you may have seen some pics from a recent family outing. Last week Wednesday we went to our first baseball game with Cason. I wasn’t sure how he would do. He’s two now but his attention span still isn’t super long. Luckily we had some veteran baseball game parents who could show us “the ropes,” my brother and sister-in-law. We ended up getting to the game about 30-45 minutes early and went down to watch the players warm up on the field. As we were standing there Cason’s eyes were just huge in awe and wonder. Baseballs…. big green field… tons of people… huge jumbotron. WHOA!!! After about 10 minutes or so watching them warm up, the boys (2 nephews and little man), had had enough. It was time to go play. So off we went to the HUGE 2-3 story playground. I have to admit I was a little nervous. I mean I get scared to let him climb around at Chick-fil-A! All the bigger kids pushing around, lots of places to get lost in the maze, what if he falls? Yeah … needless to say I had an eagle eye gaze on him the whole time he was in there. Luckily his older cousin was by his side the whole time watching out for him. Post playground time we headed in to get some baseball grub and watch the game. Cason and I shared some cheeseburger sliders but apparently that was not good enough for him. He decided to mosy on over to his Aunt and chow down on her nachos and then finish off the night with a little ice cream. Speaking of good food! 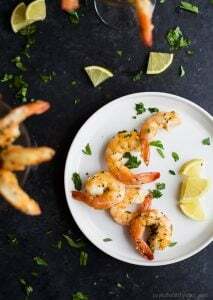 Are you guys fans of Shrimp Scampi? As a way to make this dish a little healthier, I whipped out my spiralizer again. If you guys don’t have one you, you totally need to get one. They are fun to use and a great EASY way to put more veggies in your diet. This dish seriously took me by surprise, taste wise! 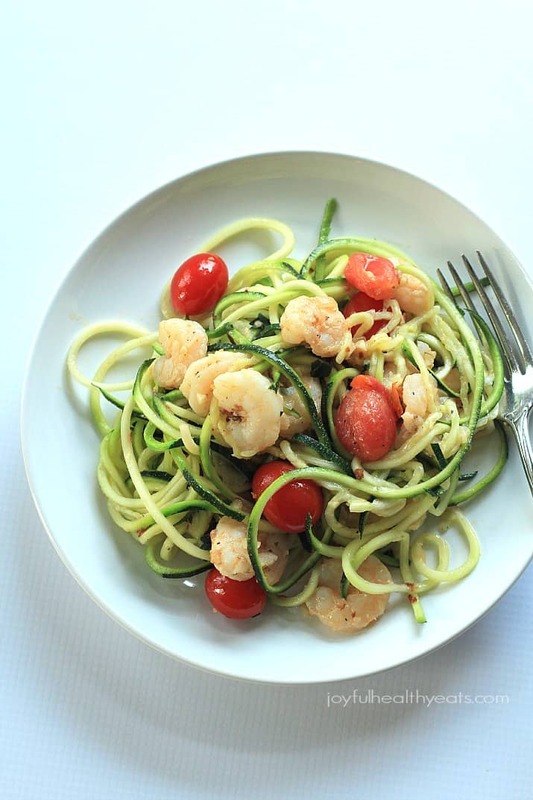 I loved the zucchini noodles with all the scampi flavors and even added a little touch of butter to finish the sauce that ended up tying everything together and made it absolutely irresistible to eat! I hope ya’ll get a chance to try it. If you by chance don’t have a spiralizer, in order to create zucchini noodles you could use a peeler or a mandolin. Save your favorite recipes to your own personal recipe box! 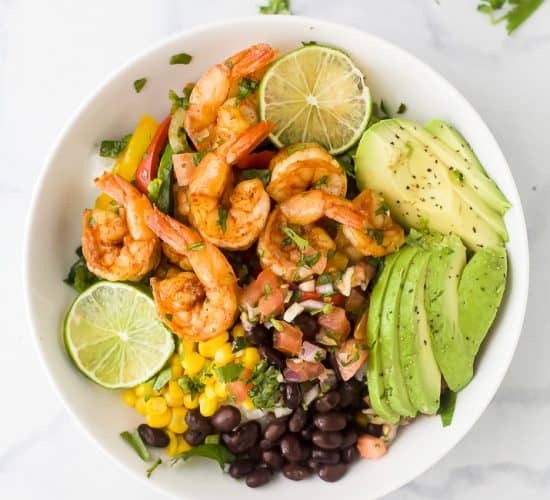 Click the SAVE button in the recipe box below to create your own meal plans! Awesome-ness! Immediately season shrimp with 1/2 teaspoon of red pepper flakes, salt & pepper. Saute each side for 2-3 minutes or until the shrimp turn opaque in color. Into the same skillet the shrimp were in add onions, saute from 3-4 minutes until translucent. Next add garlic and saute for 30 seconds, immediately add white wine to deglaze and scrap all the brown goodness off the bottom of the pan. Add in the cherry tomatoes, cover skillet and saute for 3-4 minutes or until tomatoes start to get somewhat soft. 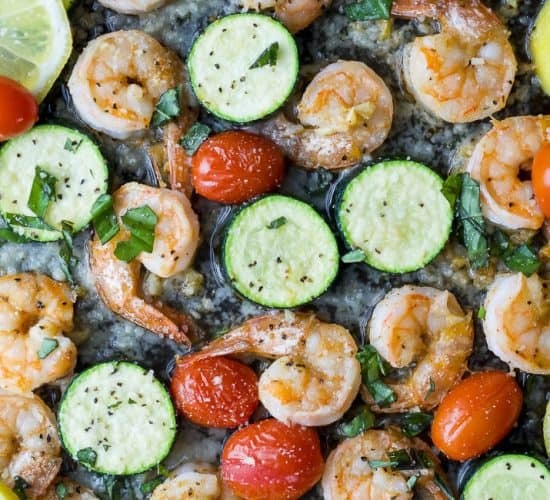 Add shrimp back to the pan, butter, lemon juice, 1/2 teaspoon of red pepper flakes, and basil. Stir until butter melts. Heat a large non-stick skillet to medium high heat. Add 2 tablespoons of olive oil to the pan and then zucchini noodles. Saute for 2-3 minutes, and remove. Add noodles to the shrimp mixture, toss to coat and serve! We love shrimp scampi! 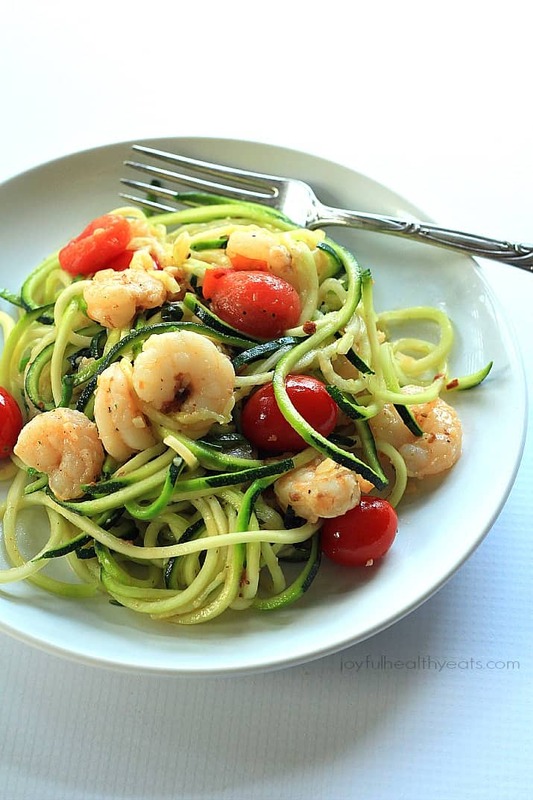 Love the zucchini noodles addition! Awesome! 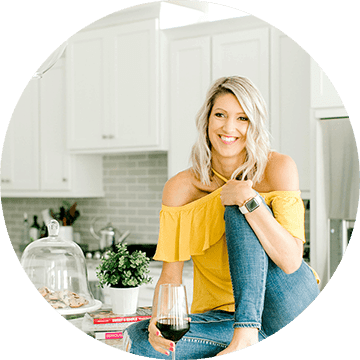 Love zoodles… what a beautiful recipe Krista! Girl, this dish is right up my ally! Love all the colors and flavors here. YUM! And what fun day at the baseball fields! I bet the lil boys loved being that close to the action! Sounds like you are a girl after my own heart food wise chica! So, I am coming for dinner! Is that okay? 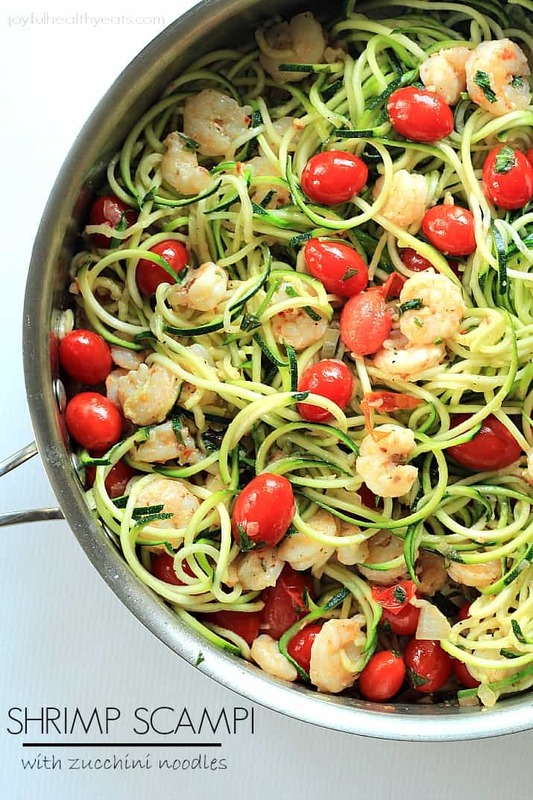 I am obsessed with Zoodles and shrimp scampi…so this is totally my jam girl! Pinned! Absolutely! 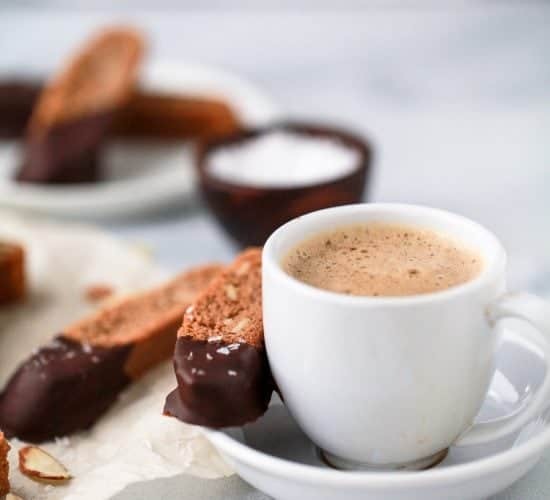 You just need to bring some dessert.. thats my rule. 🙂 Thanks for pin girl! I totally have to jump on this zoodle train!! This looks equally cozy and refreshing! haha.. well… choo chooo hop on board. My daughter was never much of a climber. I remember when she was little, hating it when I couldn’t see her so high up. There is nothing scary about this delicious and healthy dinner though. It is all kinds of wonderful. 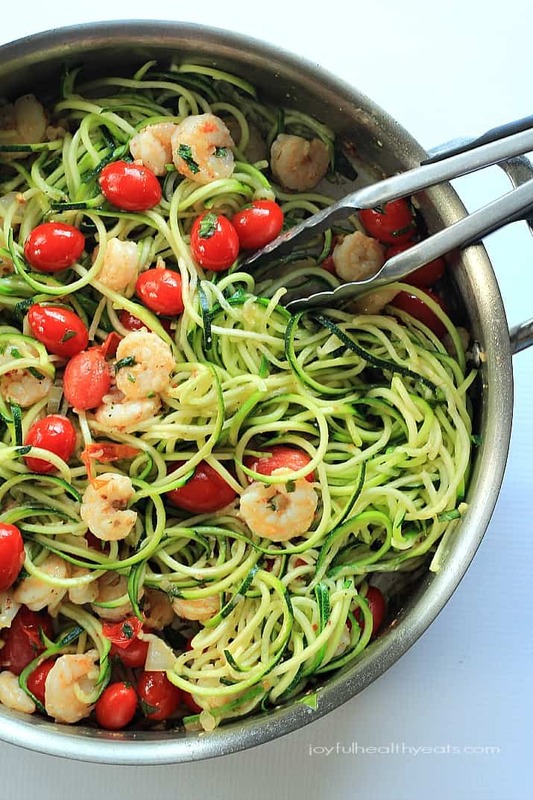 Zoodles never looked better! 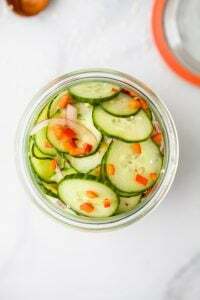 I’m still obsessed with anything zucchini! haha…. me too girl! 🙂 Zucchini for life! 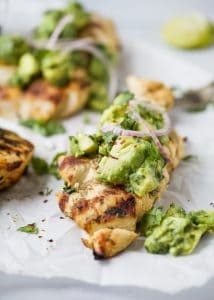 I can just tell I’m going to loveee this recipe! Can’t wait to try it out! Ohh! I am loving this lightened up version! 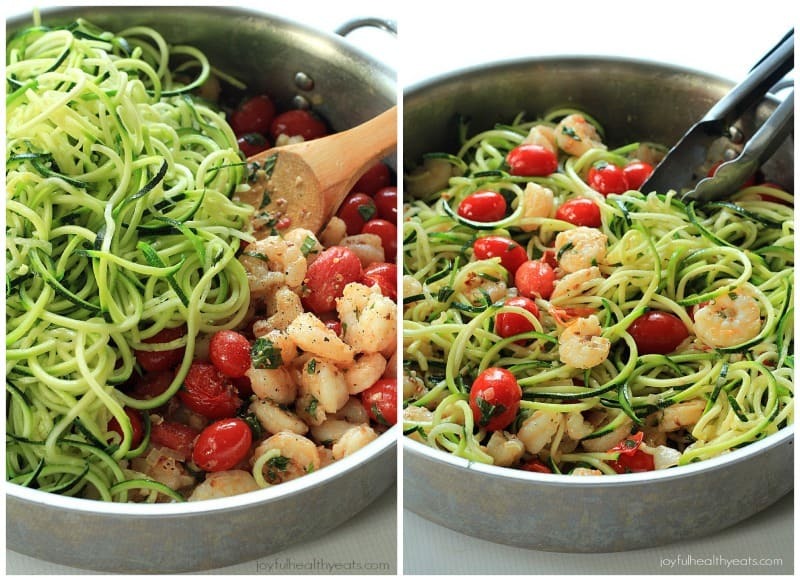 Such a good idea to incorporate the zucchini noodles! 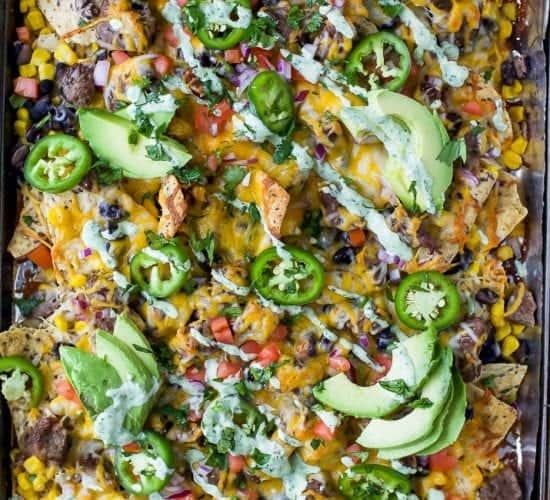 These photos look so beautiful, Krista — I just want to dive into that pan! thanks so much Marcie, you are so sweet! 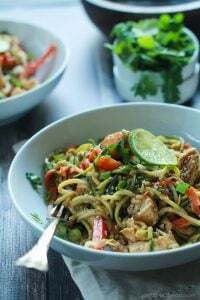 You are really rocking those zucchini noodles! Gonna be pinning these. I seriously should get a spiralizer. You so should, I promise you’ll fall in love with it! 🙂 Thanks for the pin girl! This look so good! I’ve never made zucchini noodles but I need to try this asap! you are missing out.. go make them…. now! Just tried this today – A-H-MAZING! I forgot how much I love zucchini pasta! I also love how very few and simple spices created such a satisfying taste. Can’t wait to have my other remaining half at uni tomorrow! Thank you! Ohhh yah!!! So excited that you liked it. 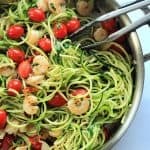 Zucchini noodles rock! 🙂 Totally just made my day with this comment! 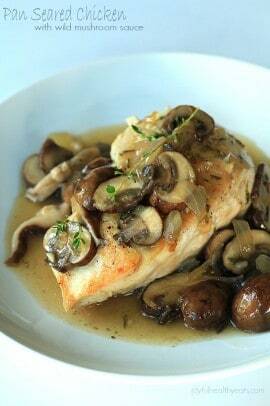 Just made this for dinner and it was AMAZING! I had bought a veggie spiralizer a while back and just used it for the first time with this dish. Thank you for the delicious recipe. I’ll definitely be trying your other recipes. We made this for dinner last night and it was FANTASTIC. So flavorful and just the right amount of heat. Thank you! 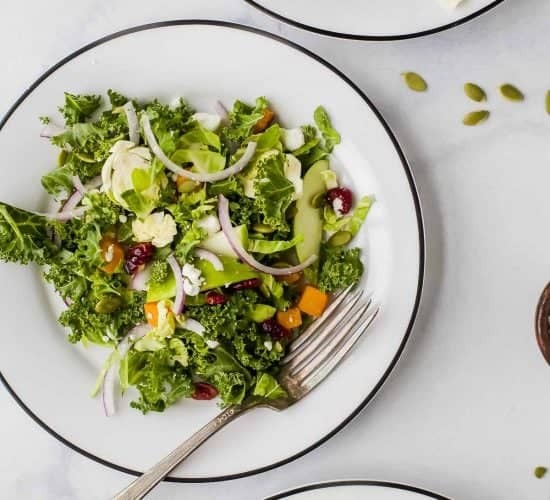 What’s paleo all about? | Melanie Craft co. Butter isn’t actually Paleo. 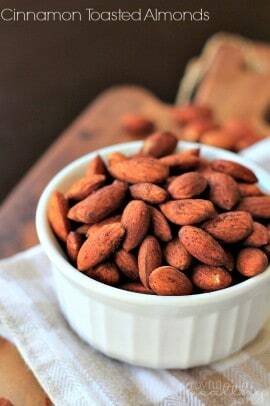 Do you have a recommendation for a Paleo substitute?